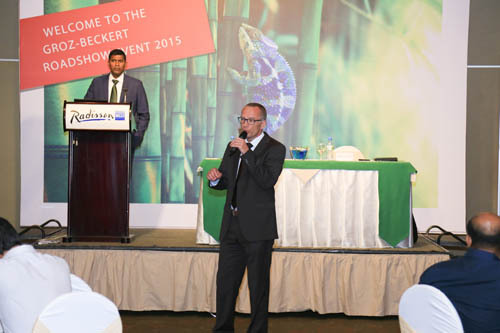 Albstadt, Germany/Dhaka, Bangladesh: To show the customers in Bangladesh the full range of Groz-Beckert’s products and services the company will have three road shows in 2015 in Dhaka. On Thursday, April 16, Groz-Beckert launched the first road show. At the same time two events took place at the show: One for the field of knitting, the other for the area of sewing. 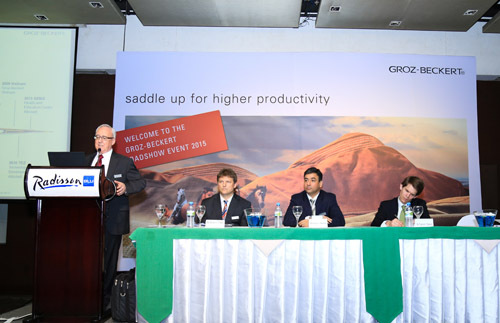 Groz-Beckert focuses in his road shows the topics “quality”, “cost reduction” and “productivity” in order to show the customers their hidden potentials. The invited guests not only had the chance to get to know the products and services better but also to discuss and exchange ideas. In recent years, Bangladesh has become one of world’s most important suppliers of textiles. Accordingly, the textile manufacturers did significant investments in their machinery parks, so that the equipment of most manufacturers is very modern today. Of course, this also means that this manufacturer uses ultra-modern knitting and sewing needles as well. So, for example, the customers appreciate the immense benefits of knitting needle “Litespeed”: Modern high-performance circular knitting machines frequently have their speed reduced by high temperatures. In practice, temperatures of up to 100°C have been measured on cylinders or cam parts. The optimized shank geometry of the Litespeed-needle reduces the machine temperature and the energy consumption up to 20%. The combination of lower heat build-up, optimized oil distribution in the shank area and improved needle shank flexibility enable higher machine speeds and, as a result, an increase in productivity. But Groz-Beckert supports the developments in Bangladesh’s textile industry not only with high-quality products but also with a variety of services. As a good product quality has become a minimum requirement of the markets, factors like sustainable production and efficiency increases, warranty of compliances as well as the wish for new and more sophisticated designs are gaining importance.